All script settings are stored in INI file in Max "ui\macroscripts" folder. [*] Hold Control key while executing to load the INI file for editing. the names of all keys are descriptive, so not the big deal to edit them. 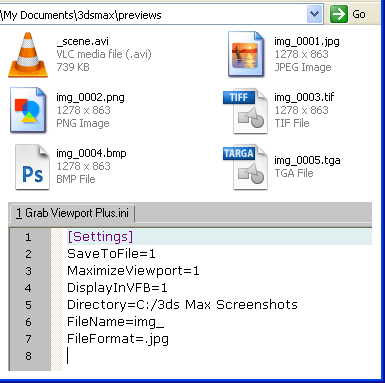 "MaximizeViewport" -- toggle Expert Mode + Maximize Viewport. "DisplayInVFB" -- whether to display or not the shot. "Directory" -- is the output path. "FileName" -- is the base prefix. "FileFormat" -- the output file format. enable them by set their value to 1 (or whatever else different from 0). If "FileName" key is empty, the "img_" will be used by default. the JPEG (.jpg) will be used by default. 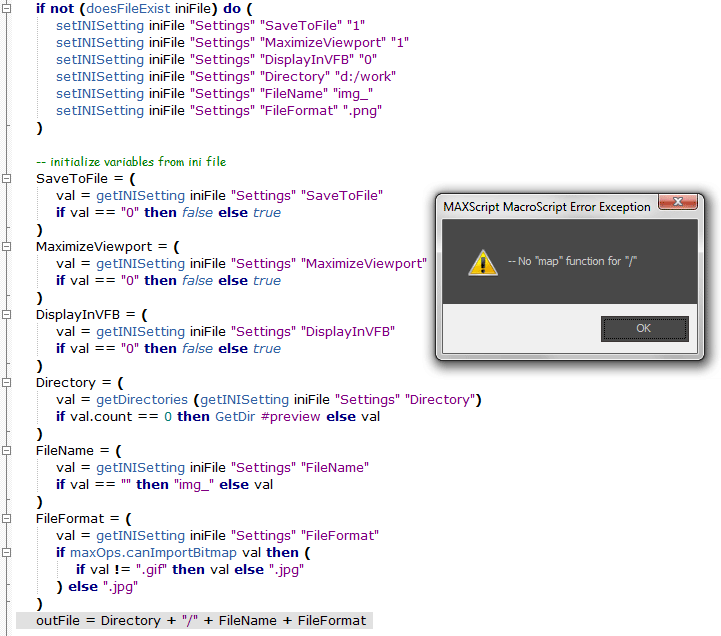 Installation: Typical/normal macro script installation. Submitted by Anubis on Mon, 2010-04-26 14:25. Submitted by harumscarum on Mon, 2010-04-26 13:58.
expert mode is only working when viewport is not maximized? Submitted by Anubis on Mon, 2010-04-26 13:22. Submitted by harumscarum on Mon, 2010-04-26 12:18. Submitted by Anubis on Mon, 2010-04-26 10:14. Submitted by Anubis on Mon, 2010-04-26 08:06. Realy strange error for "/". Realy strange error for "/". The expert mode is ok I think, if you notice that is a little bit slower, that come only in PNG (due to my test). Submitted by harumscarum on Mon, 2010-04-26 03:53.